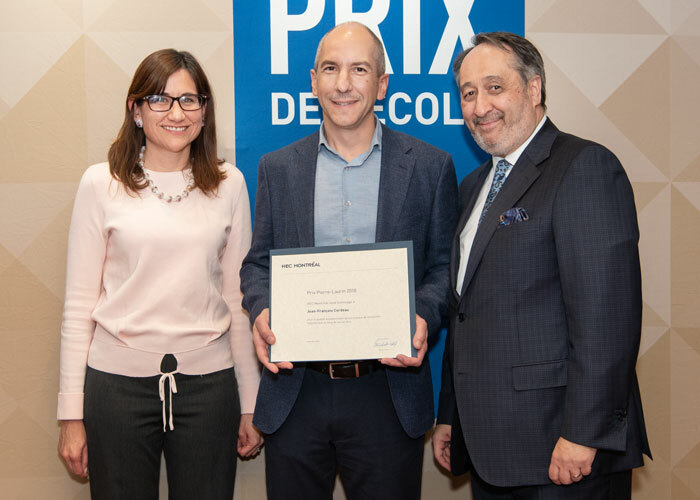 Claudia Rebolledo, Director of the Department of Logistics and Operations Management, Jean-François Cordeau, winner of the Pierre-Laurin Award, and Michel Patry, HEC Montréal Director. This year’s Pierre Laurin Award, recognizing the recipient’s research excellence and contribution to the scientific reputation of HEC Montréal, has been given to Jean-François Cordeau. He received this distinction on November 28, at the School’s annual award ceremony. Jean-François Cordeau has spent most of his career as a researcher at HEC Montréal, beginning with writing his Master’s thesis in the summer of 1994, supervised by Michel Gendreau and Gilbert Laporte. He went on to earn a PhD from Polytechnique Montréal, in 1999, the year he was hired by HEC Montréal as an assistant professor. His first scientific article was published in 1997, in the prestigious Networks journal. Entitled “A Tabu Search Heuristic for Periodic and Multi-Depot Vehicle Routing Problems,” based on his Master’s thesis, it remains his second-most cited article to date, with over 880 citations. Professor Cordeau’s contributions obviously do not stop there. Over the past 24 years, he has written 133 articles and 8 book chapters. According to Google Scholar he has over 17,700 citations and an h index of 62. Professor Cordeau may be described as one of today’s leaders in the international operational research community. His work focuses on developing mathematical models and algorithms for solving problems mainly in logistics and transportation. His research results include the design of optimal vehicle routing and scheduling in fields such as adapted passenger transportation and the integrated planning of flight crew scheduling and flight itineraries. His algorithms have been applied to improve the management of the Téo Taxi fleet of electric vehicles. Other applications of his research involve facility location problems – warehouses for humanitarian aid supplies, for instance – and network design for production, distribution or transportation. He is also interested in maritime, rail and road transportation terminal management. For example, he has worked on scheduling cranes for loading and unloading ships. He has been recognized on numerous occasions by the scientific community for his exceptional contributions, receiving many awards and distinctions. These include first prize in the 2009 ROADEF Challenge and the Award of Merit from the Canadian Operational Research Society in 2016. In addition, he was elected a member of the College of New Scholars, Artists and Scientists of the Royal Society of Canada in 2014.